Who would have believed that the Fender Stratocaster is 60! The quintessential rock guitar, the Fender Stratocaster is indeed 60 years old. However, it has to be said that for a guitar that is fast approaching old age it is still just as fresh and innovative as it was the day it was launched. I only hope I look as good when I am 60! Released in 1954 to well deserved critical acclaim the Fender Stratocaster is, for many of us, the guitar that we aspire to have. But the question is why has it been so successful? It might be that it is a guitar that has been used by so many of the world’s great guitarists. From 60s guitar legends Jeff Beck, Eric Clapton and Jimi Hendrix to modern day rockers such as John Frusciante and The Edge the Stratocaster has been a constant in guitar driven music. However, for me it is the design of the guitar that has led to it being the guitar of choice for so many of us. The Fender Stratocaster was designed by Leo Fender, George Fullerton and Freddie Tavares and was launched in the US in 1954. The guitar was quickly recognised as being a real step change in guitar design providing the player with a number of improvements which quickly earned it a place in guitarist’s hearts. The design of the guitar was aimed at providing the guitarist with the most comfortable playing experience and was a real change from the flat slab like appearance of other solid body guitars such as the Telecaster. The body featured a double cut-away allowing the player easy access to the upper frets. If you look at contemporary models such as the Telecaster and the Gibson Les Paul they only had the one cut-away. The back of the Strat body was contoured, for player comfort, so that it had, what some players have described as the “beer gut curve”. The gentle chamfer on the front of the body where the guitarists strumming hand rests and the modern feel of the bolt on neck also added to the playing comfort of the guitarist. The innovative design of the bridge was either loved or hated by players. The bridge was a through body design where the strings were anchored on a pivot bridge which was attached by springs to a claw in the tremolo cavity. For players such as Jeff Beck and Ike Turner the bridge was used to great advantage to create a unique sound but others such as Ronnie Wood and Eric Clapton disliked the propensity for the bridge to detune the guitar. To address this concern Fender produced “hard tail” versions where the bridge was fixed. 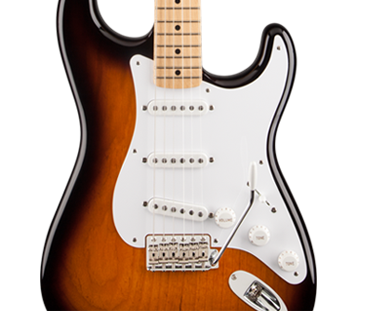 The Fender Stratocaster was designed with three single coil pick-ups which were accessed through a five way selector switch. The great flexibility of this design gave the guitarist a huge tonal range allowing them to really experiment with the sound that could be produced from the instrument. To commemorate the fact that the Fender Stratocaster is 60, Fender is to release 6 commemorative guitars which aim to capture the past, present and future of the Fender Stratocaster. The guitars are due for release in March 2014 and range from a 60th Anniversary American Vintage 1954 Stratocaster to the rather cool looking Deluxe Stratocaster HSS Plus Top with iOS connectivity. All in all Fender are looking to deliver something special with the 6 commemorative models. However, looking at the promotional material the guitar we are getting excited about is the Fender Fishman Tripleplay Stratocaster HSS and we hope to come back soon with more details about this latest development in the Fender Stratocaster story. For now we will end by wishing the Fender Stratocaster a happy 60th birthday. To find out more and to see how you can celebrate the fact that the Fender Stratocaster is 60 take a look at the Fender site.